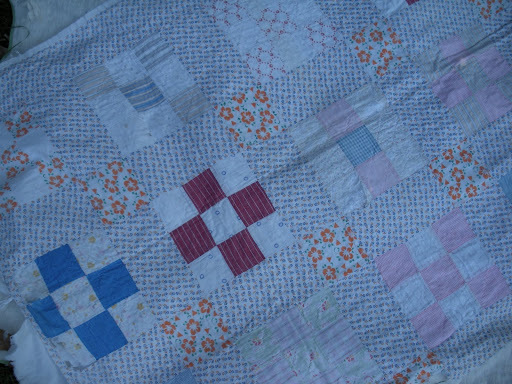 Here are two more treasures, from this bunch of vintage quilts. This is a very sharp looking nine-patch, all blues and indigos against a tan ground. 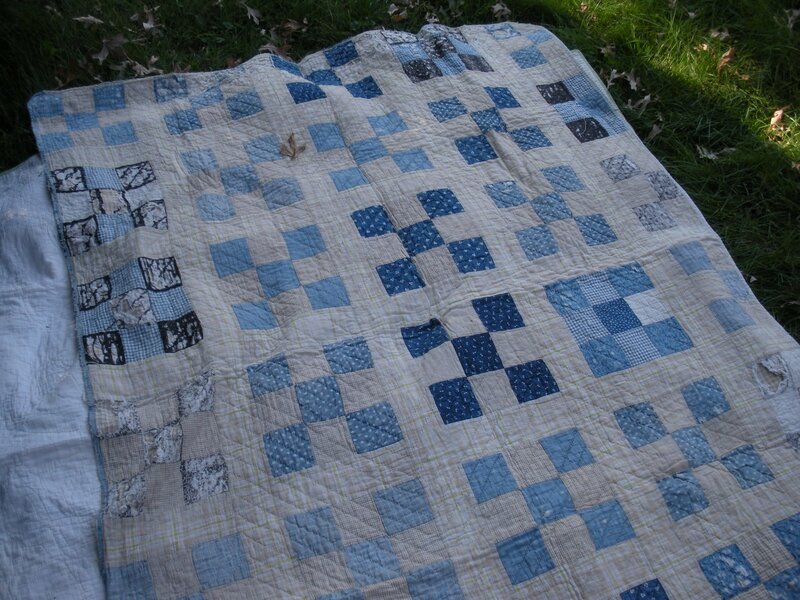 This one is merely a scrap of what was once a larger, probably full bed size quilt. It’s pretty scrappy, except that the sashing and cornerstones are all the same (and in remarkably great shape ) Somebody apparently just chopped it in half at some point, maybe it was bought as a “cutter” and used for crafts. I may get some pillows out of the blocks, and repurpose the sashing and cornerstone fabrics. Even though it’s already chopped up, it still hurts me when I cut into these! 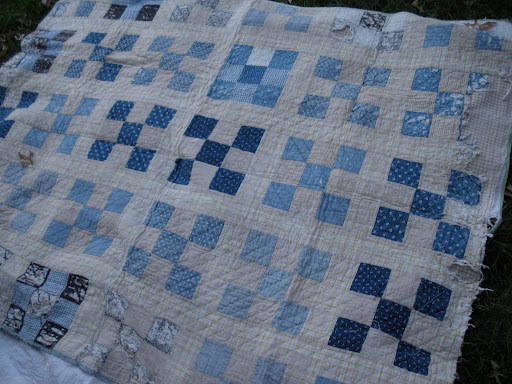 How do y’all feel about using quilts as cutter quilts? 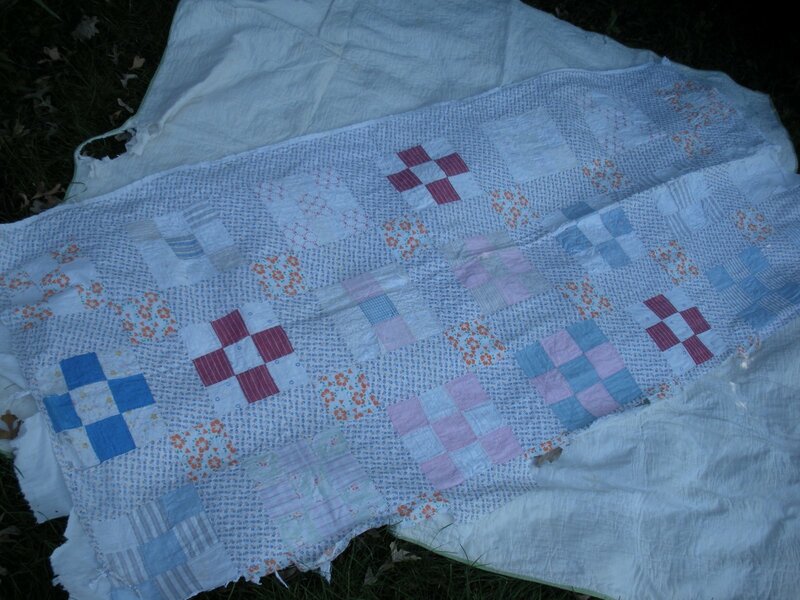 I have never cut into a quilt to use as a “cutter” quilt…not sure that I could….depends on the state of the original quilt…and if it has any special significance – say a family quilt….I have an old “wagga” that my grandmother made and I salvaged it from Dad’s shed where he had it covering up a machine on his work bench! !…it is made with fabric squares stitched on to one side of the front of a woolen coat….it was made during the 30’s I think…there are some pieces of fabric that have worn away but I wouldn’t try and replace them…it is very special to me as I don’t have many things that Grandma made….she did beautiful crochet work as well….! 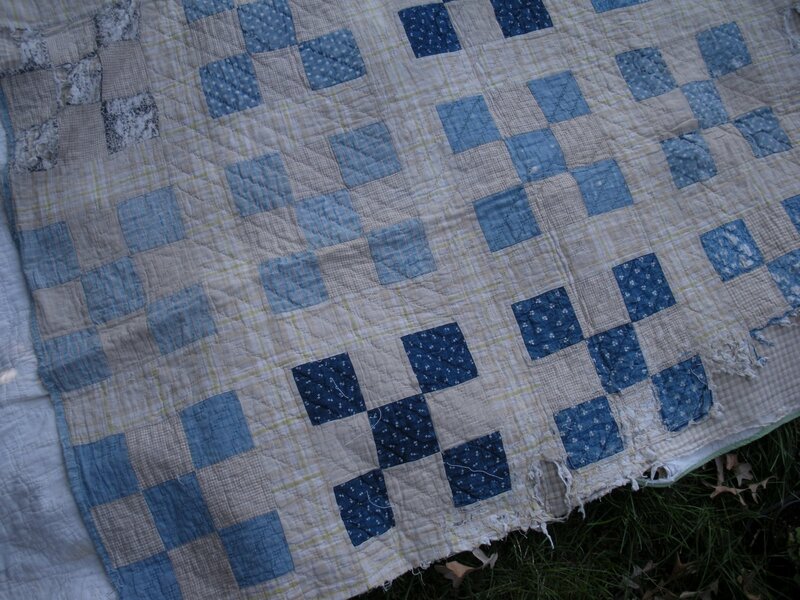 you know i’ve cut into quilts…i love making something useful or salvaging old quilts in some way. i hate to seem them not being taken care of. i agree with lorraine though…if it had family ties or special significance to me it would be harder to cut.